Investment / Information for investors. The Commune of Gogolin is located in the south-eastern part of the Opole Voivodeship. To the east, it adjoins with the Commune of Izbicko; to the south – with the Commune of Zdzieszowice; to the west – with the Commune of Tarnów Opolski. The Commune is located on the edge of the Silesian Upland, in a place where limestone hills rise above the Odra River Valley. 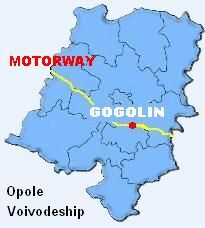 The A4 motorway with one motorway junction Gogolin runs through the Commune, voivodeship roads no. 409, 423 and 424. Another advantage is the international railway line no. 136 that runs trough the Commune and an airfield in Kamień Śląski, currently under construction. A major distinguishing feature of the Commune is the high level of industrialization. Because of the available natural resources, the cement and lime industry is the prevailing branch in the Commune. Moreover, there are many entities operating in printing branch, furniture sector, catering, as well as bakeries, transport and shipping companies end entities operating in the building sector. A single-track overhead 220kV power line runs through Groszowice Opole-Kędzierzyn and a single-track 110kV two-track line Zdzieszowice-Górażdże – through Groszowice and Blachownia – Gorwap – Tarnów Opolski. There are two Main Power Feed Points that satisfy the needs of the Commune’s industry, the so called GZPs of 110/15 medium voltage kV: Górażdże and Gorwap. High pressure gas piping: Zdzieszowice – Wrocław as well as high pressure coke-oven gas piping: Zdzieszowice – Górażdże – Wapno Sp. z.o.o are run through the commune. There is a complete water supplay and sewage system in the Commune. There is also a wastewater treatment plant in Chorula. ü GÓRAŻDŻE CEMENT S.A. (Heidelberg Cement Group) - cement industry. ü GÓRAŻDŻE WAPNO Sp. z.o.o. (Lhoist Group) - limestone industry. ü FLAMY BLOCK In Gogolin - production of wood briquettes. ü ZAKŁAD STOLARSKI Szampera - carpentering. ü MAGNUM s.c. in Chorula - transport. ü CHESPA Sp. z.o.o. In Chorula - printing. ü GNIOTPOL Sp. z.o.o. in Odrowąż - truck structures. ü Zakład Piekarniczo-Cukierniczy Zimmermann - bakery and confectionery. ü OERLICH SPEDITION Sp. z.o.o. in Malnia - building materials store-yard. ü mTP MET-PLAST Sp. z.o.o. in Dąbrówka - Production of metal and plastic parts. Area: 12,01 ha and 7,75 ha. Undeveloped area, owned by the State Treasury. The local land development designates the area for services, production, warehousing, logistics, transport and technical services. Area: 2,27 ha. Undeveloped area, owned by the Commune Council of Gogolin. The local land development designates the area for services, production, warehousing, logistics, transport and technical services.